Keeping track of everything that you and your team need to do is pretty important. 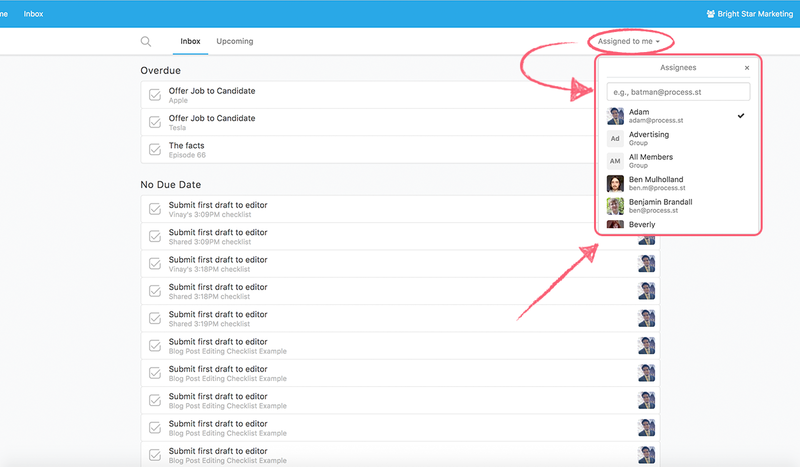 Luckily, Process Street’s Inbox feature lets you do just that! To access Inbox, simply click on the ‘Inbox’ button next to the ‘Home’ button at the top left of your screen at any time within the app. 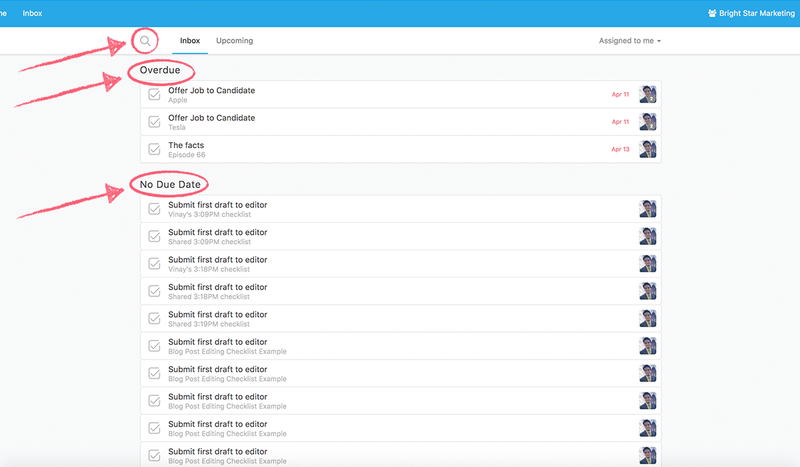 Once inside of Inbox, you can see all of the tasks and checklists that you’ve been assigned, sorted by when they’re due across all of your folders and checklists in one convenient location. 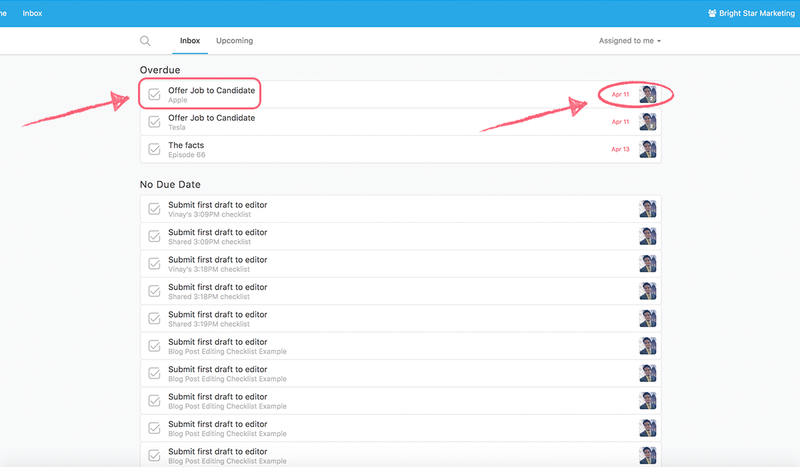 Tasks and checklists without due dates are listed after everything that’s due. 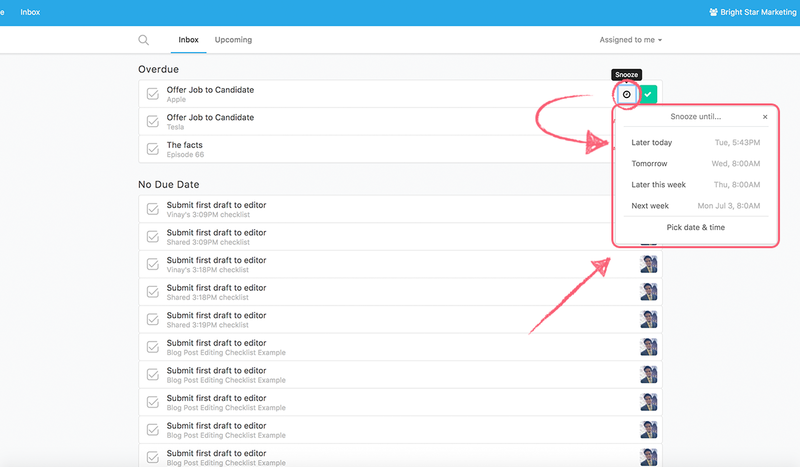 If you have a lot of assigned tasks and checklists, you can use the search feature of Inbox by clicking on the magnifying glass to find exactly what you’re looking for! 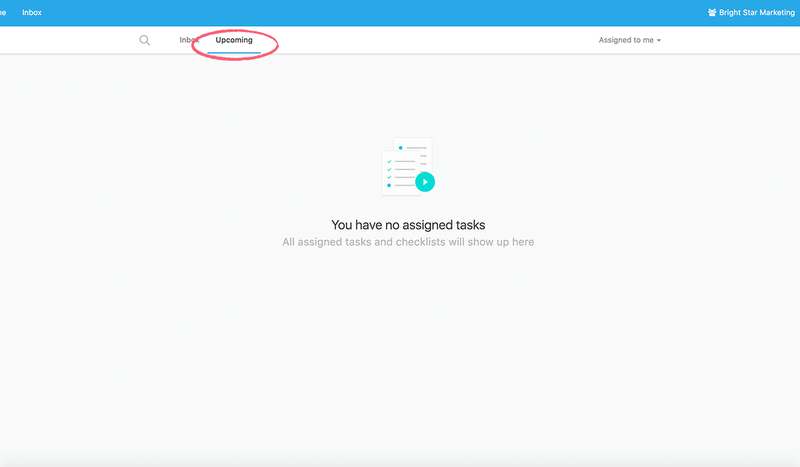 Assigned tasks are represented by a box with a single checkmark icon, while assigned checklists are represented by a document with a three lines icon. You can complete a task or checklist right from within Inbox by clicking on the green ‘Complete’ button on the far right of the task or checklist. If you’re not ready to complete a task or checklist, simply click on the ‘Snooze’ button directly to the left of the ‘Complete’ button to push it off to a date and time of your choosing. You can use our multi selection tool to ‘Complete’ or ‘Snooze’ checklists or tasks en masse. You do this by hovering your mouse cursor over the task or checklist icon. 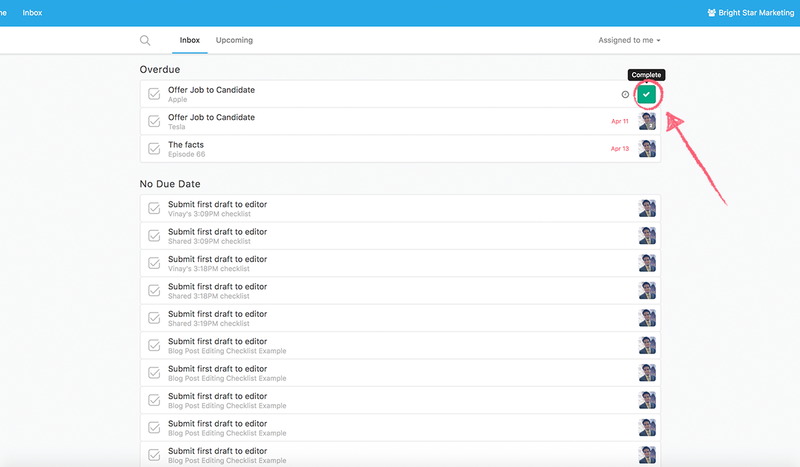 You can then select which tasks or checklists you want to select. Then you can either snooze them to a later date or complete them from here. Process Street will notify you with an error message if you have any required fields in the checklist that need to be filled in before the checklist can be completed. To view tasks and checklists assigned to your teammates and even entire groups, click on the ‘Assigned to me’ drop-down on the top right of the page in Inbox. 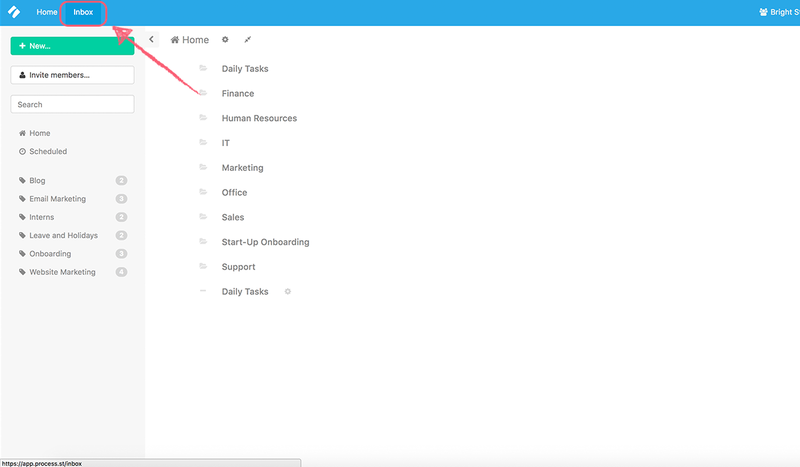 Once you’re done with all of your tasks and checklists, you can get ahead of the ball by visiting the ‘Upcoming’ tab to see everything that hasn’t yet come up as due.